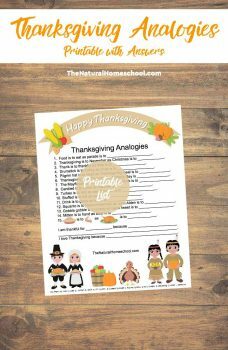 Take a little break from your regular math lessons to let your children practice their logic skills with these Thanksgiving Analogies from The Natural Homeschool! Critical thinking and logic skills are useful in any area, and your kids will love learning these skills with these Thanksgiving-themed analogies! For other Thanksgiving resources, check out this full list of activities to use to get into the holiday theme! Get your FREE Thanksgiving Analogies Printable here!